Hands Off Assata Shakur: Angela Davis Calls for Radical Activism to Protect Activist Exiled in Cuba | Democracy Now! author, activist and professor emerita at the University of California, Santa Cruz. Her latest book is titled Freedom Is a Constant Struggle: Ferguson, Palestine, and the Foundations of a Movement. President Obama concluded his historic visit to Cuba last week as the first sitting U.S. president to visit the island in 88 years. During his trip, Obama met Cuban President Raúl Castro and delivered an address to the Cuban people, the first-ever live address by a sitting U.S. president to the people of Cuba. But one issue not raised during his visit was the fate of Assata Shakur, the legendary figure within the Black Panther Party and the Black Liberation Army who now lives in Cuba, where she has political asylum. Shakur was convicted May 2, 1973, of killing of a New Jersey state trooper during a shootout that left one of her fellow activists dead. She was shot twice by police during the incident and has long proclaimed her innocence. We speak with author and activist Angela Davis, a longtime supporter of Shakur. AMY GOODMAN: “A Song for Assata” by Common. This is Democracy Now!, democracynow.org, The War and Peace Report. I’m Amy Goodman. In this Women’s History Month special, we continue our conversation with Angela Davis. Last week, President Obama became the first sitting U.S. president to visit Cuba in 88 years. During his trip, Obama met with Cuban President Raúl Castro and delivered an address to the Cuban people, the first-ever live address by a sitting U.S. president to the people of Cuba. One issue that was not raised publicly during his visit was the fate of Assata Shakur, the legendary figure within the Black Panther Party and the Black Liberation Army who now lives in Cuba, where she has political asylum. Assata Shakur was convicted May 2nd, [ 1973 ], of killing a New Jersey state trooper during a shootout that left one of her fellow activists dead. She was shot twice by the police during the incident. In 1979, she managed to escape from jail and later fled to Cuba. She has long proclaimed her innocence. In 1998, Democracy Now! aired her reading an open letter to John Paul II, who was pope at the time, during his trip to Cuba. This is an excerpt. 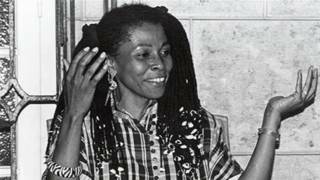 ASSATA SHAKUR: In 1977 I was convicted in a trial that can only be described as a legal lynching. In 1979 I was able to escape with the aid of some of my fellow comrades. I saw this as a necessary step, not only because I was innocent of the charges against me, but because I knew that [in] the racist legal system in the United States I would receive no justice. I was also afraid that I would be murdered in prison. I later arrived in Cuba where I am currently living in exile as a political refugee. AMY GOODMAN: That was Assata Shakur speaking in 1998 in an open letter to Pope John Paul. Our guest, Professor Angela Davis, has been a longtime supporter of Assata Shakur. I asked her about Assata’s case and the thawing of U.S.-Cuban relations. ANGELA DAVIS: I’ve been involved in the campaign to save Assata’s life for all of those decades. And now, of course, as there are new openings with respect to Cuba, we welcome the end of the embargo, the blockade, but at the same time we have to be attentive to what this might mean for Assata, given that there is $2 million reward on her head, that she has been designated as one of 10 most dangerous terrorists in the country. AMY GOODMAN: And a former Republican presidential candidate, Chris Christie, the governor of New Jersey, was really leading that charge. ANGELA DAVIS: —Madam Secretary, in which an Assata-like character was approached by the secretary of state, and the secretary of state acknowledged that she had been wrongly convicted. And the issue is resolved by promising to provide the support of the State Department to Assata in a new trial in the U.S.
AMY GOODMAN: Right. And it was part of the process of normalization in Madam Secretary. AMY GOODMAN: —when she goes down to Cuba. And in that situation, they said that Assata Shakur’s case was instrumental to normalizing relations. And I want to go to a clip of that. ELIZABETH McCORD: [played by Téa Leoni] There are people who want you to come back to the U.S. to serve your sentence. What if I could ensure that you would be at a minimum-security prison close to your daughter in Connecticut? You have a grandson you haven’t met. You would be eligible for parole in three years. AFENI RAHIM: [played by L. Scott Caldwell] Wouldn’t that be convenient for you? I simply turn myself over to the feds, and you get whatever it is you want. ELIZABETH McCORD: Under COINTELPRO, the FBI wiretapped your defense team, and they suppressed forensic evidence that made it clear you didn’t fire the murder weapon. Afeni, based on these findings, Attorney General Cronenberg is offering you a new trial. And we will make sure that these files are splashed across every newspaper in the country. AMY GOODMAN: That is the CBS drama Madam Secretary doing their own kind of take on a kind of Assata Shakur, who ends up agreeing to come back to the United States, and the secretary of state saying she would get a fair trial and something to do with time served. ANGELA DAVIS: Well, yeah, Assata has not seen her grandchildren. It’s horrendous, the extent to which the repression associated with the era of the late 1960s and 1970s continues to this day. And we might also mention the fact that vast numbers of people are still behind bars from that era, members of the Black Panther Party—Mondo we Langa, Ed Rice. My co-defendant, Ruchell Magee, has been in prison for over 50 years. So I think that when we put all of these things together, they create a kind of invitation for increased radical activism for trying to resolve these issues that have been decades in the making. AMY GOODMAN: Angela Davis, professor emeritus at University of California, Santa Cruz. Her latest book is titled Freedom Is a Constant Struggle: Ferguson, Palestine, and the Foundations of a Movement.